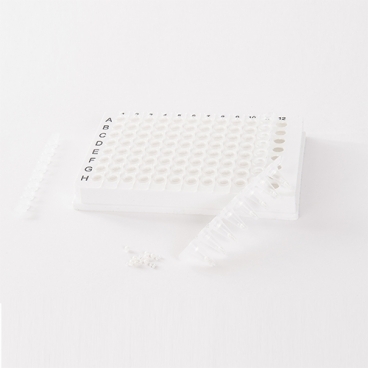 Tissue homogenizing CKMix 96 Well Plate - Bertin Corp.
Includes one breakable 96 well-plate (96 x 300µL) containg a mix of 1.4 mm and 2.8mm ceramic (zirconium oxide) beads in each well + 12 caps strips. CKMix is designed for tissue homogenization like : mouse/rat tails, plants and small pieces of organs like : brain, liver, kidney, ear, lung, heart, spleen, artery, arabidopsis, leaves, tumor, intestine, adipose tissue and more. Sample size range:from 0.6mg to 12mg tissue or 3µL to 120µL culture.